I had planned to talk about Caoimhe's passing a week ago. I felt guilty for not being there for Magic's mums and the entire pack during such a devastating ordeal. Thank you for posting this in your blog, Magic. I truly hope that their hearts have healed and mended after having to do that heart-wrenching decision. On a more lighter note, still related to Magic, I have sewn Timothy the Turtle back to life. He was one of the first toys we ever got and coming from Magic, nonetheless. He was ripped apart by Peanuts and Ginger a couple of months ago, so I took the liberty of taking him with me so he can live a longer and happier life with Chooey. Minus the squeaker, plus a couple of Frankenstein stitches and VIOLA! Timothy is ALIIIIVEEE!!! We agree, way to go Timothy you will live to suffer another chew! BOL. Have a fabulous Friday. We don't know Caaoihme, but we are very sorry for the loss. Mom wishes she could restore some of our stuffies, but Lightning is a master of total destruction. So sorry to hear about your friend, run free sweet Caoimbe. Looks like Timothy will have a better time with Chooey than the other rascals. Elliot is the only one here who actually chews holes in toys. We feel so badly about Caoimhe's family having to make that heartbreaking decision. It was terrible. Good for you for giving them some support. We have an echidna that looks like Timmy. It's had LOTS of surgery. I just read Caoimhe's story... so sad. Poor Angel. I hope she is as peace now. 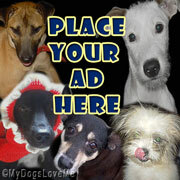 Thank you for sharing sweet Caoimhe's story. 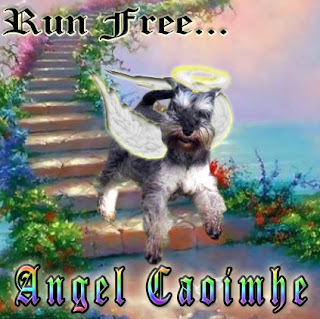 Run free sweet Caoimhe! Sewing stuffed toys back together is the story of my life. BOL!! Just read the story about Caoimhe. It hits home for us. Vaccines caused our son's epilespy. So heartbreaking. After CoCo gets a hold of a toy, it can't be fixed! BOL!! There are no easy answers when it comes to caring for us animals. Thank goodness most of us have humans who do the best they can. So sorry you lost your friend . We will be thinking of Caomine and sending loving thoughts their way. But as for "the turtle" - how I would love to get my teeth on him. Something about the creepy look on his face as he's staring into the camera. We're very sad to hear about Caoimhe. Purrs and prayers to you and your dear friend's family. We got the book, and are excited to read it. Thank you SO much! I am so furry sorry to read of your friend Caoimhe's passing. What a tragic situation for all and my heart and prayers go out to Caoimhe's family and friends. Be in peace and happiness now sweet Caoimhe. Yay Timothy the Turtle! Furry glad to see you back and put together. I hope you have a fun life with Chooey!